If you are reading this and are annoyed before I even write anything else, please click the little "x" and spare us the sarcasm and general dislike comments. Happy Marie is here! Surely the national media was on overkill for the last few days with this, but in New York where people actually care and this matters. When asked what Jeter would remember most from this day years from now he said it would be the fans, and how so many people stayed through the delay and sat in the rain to cheer for him and the team. Congrats to Derek Jeter for passing Lou Gehrig as the leader in hits as a Yankee. I was at the stadium last night and it was amazing how many people were there, and waited for an hour an a half rain delay for a game that otherwise means nothing really. Granted the Yankees want to clinch as soon as possible, however this wasn't a now or never game for us and it surely will make no difference in Baltimore's season. No one was in their seats for the top of the 1st because it was pouring (I was sitting in my seat), and between the top and bottom of the first people came and they stood. We all stood and waited for Jeter to strike out. Then most people ran for cover, and did not come back out until Jeter's next AB. When he hit that single I jumped probably as high as I could along with most everyone else. It was such an awesome feeling, even though I did nothing. One of the guys walked by and kissed me on the head, incredibly random however people were being random. Jeter was greeted by teammates in foul territory at first, some of the Orioles were clapping for him (by some I mean I saw one), but on behalf of the fans I would like to thank the O's for stepping back for a minute to let Jeter enjoy the moment. We were winning the game at that point so Jeter got to enjoy it, and the O's were respectful of what was going on. Nick Swisher, which most people didn't notice, waited a long time to get in the box after Jeter's hit. He stood there long enough so that Jeter could soak it in a little longer and take his helmet off one more time before stepping in. I had a great time and there is no where else I would have rather been last night. It could have snowed last night and I would have sat there waiting. Please take a look at this link if you are a Yankees fan living outside NY, we have linked this blog many times before and it is by far the best beat writer blog around. There is some audio from the press conference and post game there to check out. The only issue I had with this game is it took FOREVER. Trying to get it in into the newspaper (I couldn't ignore it -- Jeter broke the record), but with the 8,000 high school football and soccer games, and everything else that's going on in early September, we were so late on our deadline I know I'm going to get a nastygram from the boss. I was kind of rooting for it to be called off, just so it was one less thing to deal with. You don't love high school football on Friday night???? I love Jeter. I am so happy for him. 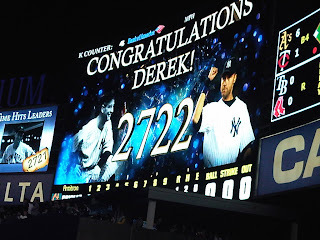 He's not the greatest Yankee to ever wear pinstripes, but he is good and has cemented his place in history. Thanks to Marie for sending me a photo from Yankee Stadium last night as I got to cover an amazing high school football where the winning team had less than 100 offensive yards. According to Jeter 9/11 2001 was a special day for the Evil Empire. Only Jeter could get away with such a bonehead blunder.